Diane Fyfe's business, R.P.O. 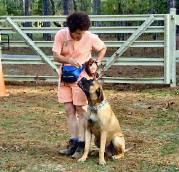 Inc. has been incorporated for 17 years and she has been training and competing with dogs for over 30 years. Diane is also a Certified Veterinary Medical Technician and is required to keep up with continuing education credits. Those credits are accumulated at veterinary conferences every year in behavior. Due to Diane's experience in many ways in competition with dogs for over 30 years, her venues include, agility, obedience, hunt tests for retrievers and conformation. She is also the previous owner of Canine Helpmates, Inc. a non profit tax exempt corporation that provided service and hearing dogs to the physically and hearing impaired. Diane has shown a few Bullmastiffs’ for a breeder in conformation. That same breeder hired her to work obedience with her dogs. The breeder was also a client with the animal hospital where Diane was employed as a Certified Vet Tech. BullmastiffInfo.org: Tell us about your training facility and expertise. Fyfe: My husband and I own a few acres with a kennel, and fenced in pasture area for agility training, and obedience classes. We also have ponds that we use for training field dogs. It is also our home. BullmastiffInfo.org: What training programs do you offer? Fyfe: Private instruction at the facility or at the owners home. Group obedience and agility classes and a small training and boarding kennel for dogs that have worked with us in some capacity. BullmastiffInfo.org: You are one of few trainers that have had quite a number of years in working with the Bullmastiff breed. How does training a Bullmastiff differ from training a different breed, such as, a Golden Retriever? Fyfe: As with all breeds there are different character traits within the breed itself and then with each individual. The Bullmastiff is a breed that can be more aloof and waits for the other party to tell them how to behave. Most of my work with a Bullmastiff is positive to develop a trusting relationship before asking them to do something demanding. Usually the Bullmastiff will tell you when they want to be sociable. QuickTime Video Plug-InBullmastiffInfo.org: Many pet owners seem to think that going to an obedience school is strictly to teach their pet how to do basic commands such as sit, stay, down, come, and walk on leash without dragging their owner around. Is this true? What other benefits are there with going to obedience school? Fyfe: It is a controlled social situation with other dogs and people. This is probably one of the biggest benefits. Obedience school is also not just for misbehaved dogs. Dogs are happier with rules and consistent expectations. BullmastiffInfo.org: When a breeder has a new litter of Bullmastiff puppies, why is it important to have the litter temperament tested? 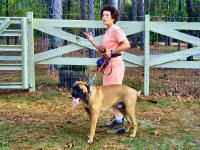 What does temperament testing a Bullmastiff litter accomplish for the breeder? Fyfe: The temperament test will tell you the work ethic of each individual. It will also tell you which individuals are going to have fear related tendencies, or dominant tendencies. Hopefully these tests will tell the breeder how to properly place each individual so they are not returned or given to a rescue organization! BullmastiffInfo.org: Wouldn’t a litter of puppies be too young to be able to tell what their temperament is going to be? Why or why not? Fyfe: The temperament test should be done at 5 and 7 weeks. Usually you will see more consistencies if the test is repeated by the same tester. Early imprints start before they leave the litter. BullmastiffInfo.org: Is behavior within a dog inherent or learned or both? In other words would a Bullmastiff born from aggressive parents be more apt to be aggressive itself? Which factor has more bearing? Fyfe: Both. The learned factor has more bearing. Yes, aggressive behavior can be learned before leaving the litter at 8 weeks. BullmastiffInfo.org: R.P.O. also does temperament testing for rescued Bullmastiffs, what characteristics make for a placeable Bullmastiff? What characteristics make for a Rescued Bullmastiff that is not placeable and should be euthanized? Fyfe: Bullmastiffs are one of our guard breeds. They are the “quiet night watchman”. Taking that into consideration, we do expect them to alarm bark at strangers and act apprehensive in certain situations. They should not overreact in a threatening or dangerous manner. They should wag their tail and be relaxed when they recognize normal behavior from a human or another dog. BullmastiffInfo.org: Why is it important for rescuers to utilize having their rescued dog temperament evaluated by a professional? How often should this be addressed with a particular rescue dog? Fyfe: It depends on the individual dog as far s how often this should be addressed. It should be done at least once. Abnormal and aggressive behavior should not be propagated. BullmastiffInfo.org: The Bullmastiff is known to have a natural tendency towards dog aggression in which case many Bullmastiff breeders and rescuers find this acceptable of an adult Bullmastiff. However, when a rescuer receives such a dog into their Rescue program – should a dog-aggressive Bullmastiff be deemed adoptable? Why or why not and under what circumstances? Fyfe: This depends on what the individual dog has learned. If they have been taught to fight, and harm other dogs, they should be euthanized. If the individual has been taught certain commands to control the dog aggression, then the situation would be workable. BullmastiffInfo.org: What is schutzhund training? Fyfe: With the proper instructor, Schutzhund training is a combination of protection, obedience and tracking taking into consideration the temperament of the dog involved. BullmastiffInfo.org: Under what circumstances would a Bullmastiff need to be schutzhund trained? Is this an appropriate breed to endure such training? Fyfe: I don’t think the appropriate term is “need”. Only with the proper intent of the handler and the appropriate temperament of the dog should it be pursued. 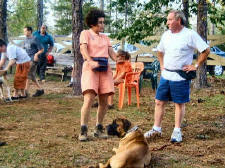 BullmastiffInfo.org: Should a family with children (or whom expect to have children in the future) pursue having their Bullmastiff schutzhund trained? BullmastiffInfo.org: As the popularity of Bullmastiff ownership rises, so are the incidents of children getting bitten by Bullmastiffs. With the media heavily publicizing dog attacks of any nature - it has potential to bring an undesirable reputation to this breed. How compatible do you think the Bullmastiff breed is with young children and babies? Fyfe: They can be compatible with the appropriate conditioning and socialization. BullmastiffInfo.org: What do you believe may be the reason for the increased incidents of Bullmastiffs, in particular, biting children? Fyfe: As with all breeds, the increase rise in popularity, therefore placement with the wrong people, and inappropriate or lack of early learned behaviors. BullmastiffInfo.org: Are there any cautions you would recommend for new Bullmastiff owners with children and/or who plan to have children in the future after acquiring a Bullmastiff to prevent dog bites? Fyfe: Investigate the temperament of the sire and dam, and socialize the young puppy with children in the appropriate manner. If it is an adult dog, investigate whether or not it has been exposed to children and find out what the experiences were. BullmastiffInfo.org: What classes do you offer at your training facility? Include the type of class/name and duration. Fyfe: Kindergarten puppy class, for ages 10 – 20 weeks, duration: 6 weeks. Basic obedience, dogs 6 mos and up, duration 7 weeks. Intermediate level One and Intermediate level two includes obedience and agility obstacle introduction, 7 weeks. The advanced class is also a combination of obedience and agility. BullmastiffInfo.org: How can interested parties contact R.P.O. to sign up for a class? BullmastiffInfo.org: What future would you like to see happen with the Bullmastiff breed in general? Do you think it this future is reachable? Fyfe: I would like to see the breed continue to propagate the appropriate temperament as described above. Breeders and rescue people should be extremely selective with new owners and potential breeders. Fyfe: I think breeders should fill out a survey investigating why they are breeding Bullmastiffs. Please report all technical questions to the Webmaster. This site is best viewed in screen resolution 1024 x 768 and browser MS Internet Explorer 5.0 or above. Website engineered and maintained by Ahmylan Impressions, Incorporated.